Dr. Sivali Ratwatte answered the inevitable call from above on 16 November 2014 after a brief illness, having lived a full life, at the age of 91, to the unfathomable emotions of many who associated with him and loved him. He hailed from the exceedingly reputable Barnes Ratwatte family. Dr. Sivali Ratwatte was born on 24 November 1923 to the late Barnes Ratwatte, (Barnes Ratwatte Dissawa) a legislator and a headman during the Colonial epoch. European Colonial Administrators at the time appointed ‘native headmen’ as leaders to function as intimidates between the Europeans and the indigenous natives of Ceylon. 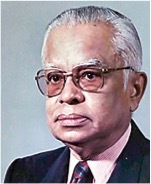 Barnes Ratwatte Dissawa was also a member of the State Council and the Ceylon Senate. Subsequently he was appointed as Rate Mahatmaya and Dissawa of Sabaragamuwa by the British to administer a large district known as Korale. Barnes Ratwatte married Rosalind Mahawelatenne Kumarihamy, daughter of Mahawalatenne Rate Mahatmaya of Balangoda. They produced six children – four sons, Barnes Ratwatte II, Dr. Sivali Ratwatte, Dr. Mackie Ratwatte and Clifford Ratwatte; two daughters, Sirimavo Ratwatte (Bandaranaike) who later held the world record of being the first woman Prime Minister, and the youngest daughter Patsy Ratwatte, who was married to Colonel Edward James Divitotawela, who founded the Central Command of the Ceylon Army. His grand daughter Chandrika (Bandaranaike) Kumaratunga became the President of Sri Lanka and his grandson the late Anura Bandaranaike, was a former speaker and cabinet minister. Dr. Sivali Ratwatte was primarily educated at the Colombo St. Bridget’s Convent and later at Trinity College, Kandy from where he gained admission to the Colombo University and passed out as a medical doctor. He discharged his duties as a medical practitioner attached to the government and private sector hospitals as well, with excellence until mid 1970 where he joined Lever Brothers Ceylon Ltd (Unilever Sri Lanka) as the Company Doctor. Dr. Ratwatte was the founder and President of a special organisation called the ‘Sinhala Tharuna Sangamaya (Sinhala Youth Organisation) where Mrs. Sirimavo Bandaranaike was the Patron, the late Dr. Buddhadasa Bodhinayake vice patron, Nimal Siripala de Silva (organiser – men’s section), Karuna Bodhinayake (organiser- women’s section), along with a Central Committee comprising Ven Alle Gunawansa Thera, Dr. Sarath Amunugama, U.K. Edmond, M. D. Premadasa, Prof. Tuly de Silva and treasurer the late Wijeratne Siriwardena, Chartered Accountant and the Secretary, the late Lakshman Ranasinghe (attorney at Law). The organisation had a great impact and an influence on the society at the time that helped to overturn the existed UNP government during the 1970 general elections. Whilst Dr. Sivali Ratwatte was working as the Medical Officer for Lever Brothers Ceylon Ltd, Prime Minister, Sirimavo Bandaranaike invited him to head the Export Promotion Secretariat, one of the first government institutions set up to promote exports. When the late President J.R. Jayewardene formed the Greater Colombo Economic Commission (GCEC), he appointed Dr. Ratwatte as Director (Promotions) of free trade zones and investment. Upali Wijewardene, Dr. Ratwatte son-in-law, was Director General of GCEC at the time. Dr. Ratwatte subsequently secured a post at the International Trade Centre, a United Nations body, based at the Export Promotion Bureau in Kathmandu, Nepal, as Adviser and Project Coordinator. With the mysterious ‘ disappearance’ of his son-in-law, Upali Wijewardene, he was compelled to return to Sri Lanka to take over as the Chairman of Upali Group of Companies. Dr. Sivali Ratwatte married Seetha Rohini Ellawala of Ratnapura and became the father of two daughters. Lakmini Ratwatte was married to the late Upali Wijewardena and later got married to Nimal Welgama. Dr. Ratwatte later handed over the responsibilities of being Chairman of the Upali Group to Mrs. Lakmini Ratwatte Welgama, while her husband Nimal Welgama assumed duties as the Chief Executive Officer of the company. His second daughter Eranthika Sirimavo Ratwatte got married to Dr. Saman Kelegama. Dr. Sivali Ratwatte was a simple, sincere and an unassuming person with a noble and magnanimous heart. Hailing from such an affluent family background and being in the cream of Colombo society, and more so being the Chairman of Upali Group of Companies, he never lost touch with the ordinary worker but developed an immense love and respect towards his employees by maintaining a close rapport with them and by getting, at times, personally involved to resolve their individual problems. As much as an extremely kind manager, Dr. Sivali Ratwatte successfully maintained discipline to its true word. His inborn human qualities always helped him to cultivate many a friend. His service to others was not expecting any rewards back or seeking any publicity either, and everyone who associated him appreciated his great qualities. Dr. Sivali Ratwatte was also the Chairman of the Commonwealth Press Union’s Sri Lanka branch. Once when Dr. Ratwatte was in London, the writer met him for the first time in 1987, while he was a student. It was a strange coincidence when the Sri Lanka High Commissioner at the time in London, Mr. Chandra Monarawala, after reading and showing a full spread article published by the writer in a London Indian tabloid New Voice on 20th February 1987 about Sri Lanka’s 39th Independence Anniversary at the Sri Lanka High Commission where Mr. Monarawala had organised an overnight Pirith Sangayana, while doing away with the old traditional Thamasha, he had requested Mr. Chandra Monarawala to invite the writer to the High Commission Office. The writer was flabbergasted and was trying to find an excuse to get out of the situation when Dr. Sivali Ratwatte persuaded the writer to take up the challenge. Upon his return to Colombo, Dr. Ratwatte advised the then Editor of the Island and Sunday Island, Gamini Weerakoon, to issue a letter of accreditation in favour of the writer, addressed to the Commonwealth Press Union in London introducing him as the London Correspondent for The Island. It gave the kick-start to the writer to take a keen interest in journalism and pursue the subject professionally in London. After twenty-eight long years, it gives the pleasure and the great opportunity to the writer, on Dr. Sivali Ratwatte’s first death anniversary, to say a ‘Big Thank You’, and pay his gratitude for having encouraged the writer to make a journalist out of him. On the occasion of his first death many relatives and close friends attended anniversary an overnight Pirith Sangayana organised by the family at his residence in Borella on 14th November 2015. A Sangika dana on the 15th morning to twenty Buddhist priests completed the religious ceremony thus transferring merit to the departed soul.